Roxanne Quimby, the multimillionaire cofounder of Burt’s Bees, spent a fortune on more than 100,000 acres of Maine wilderness, only to alienate locals with her single-minded plan of creating a new National Park. Can her son repair the damage? Lucas St. Clair at Orin Falls on his family’s land in Penobscot County, Maine. IT’S COLUMBUS DAY in the north Maine woods, which is kind of cheating. Everything looks like a fall-foliage postcard run through an Instagram filter. So let’s just acknowledge that at the moment I met Lucas St. Clair, I had been lulled into bliss by the last great wilderness in the eastern United States. And that’s not exactly the right frame of mind to begin determining whether he’s a visionary selling a dream of nature or a charmer hawking snake oil in easy-to-swallow capsules. Lucas St. Clair is quite likable. He really is. That’s worth saying. He’s a tall 35-year-old with a beard and the polished warmth of a pilot on an intercom. I’ve yet to find anyone who would disagree with this, though there are people who disagree with every word that comes out of his mouth. Some of that is warranted. Much of it is because he’s Roxanne Quimby’s kid. If you don’t know who Roxanne Quimby is, if you don’t have a sticker on your truck bashing her or aren’t one of the 2,385 members of the “Ban Roxanne” Facebook group, the very short explanation is that she cofounded Burt’s Bees, sold the natural products company for a fortune, and has spent more than a decade buying up gargantuan tracts of timber-company land around Baxter State Park — home to Mount Katahdin — with the plan of donating it to the federal government to make the first new National Park created from a big chunk of private property in more than 40 years. Now, if you don’t know anything about this, if you’re thinking, “I love National Parks” and “I love Maine,” I’m with you. But it’s not that simple. Not even close. Depending on whom you talk to, this is either a bold idea that will reinvent this struggling region or the WORST IDEA EVER. To speed things along, let’s just say that the idea has failed. So far. And for sake of brevity, let’s also say that the old idea is gone, and Quimby is gone, and that her son is pitching a new idea. Roxanne Quimby, if you haven’t already guessed, is from Massachusetts — Cambridge and Lexington, no less — and it doesn’t matter that she’s lived most of her life in the Maine woods, gave birth to twins in a cabin, and built a company on beeswax. Up here, she’s “from away,” and Mainers don’t want people from away telling them what to do with their only real commodity — the “wood basket” that supplies the forest products industry that built the region. But let’s get back to what’s new. Yes, I’m calling it new. In early September, Quimby and her family reopened two large swaths of land they had closed to the public. 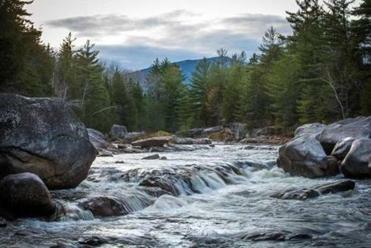 The first, which runs from Baxter State Park to the East Branch of the Penobscot River, is the bulk of the 75,000 acres they propose to turn into a National Park. It’s now ready to use like a National Park, for “light recreation” such as hiking, camping, and cross-country skiing. The other tract, 40,000 acres on the opposite side of the river, is now open to what people in Maine call “traditional uses,” which means hunting and trapping and snowmobiles and everything they’ve been doing in those woods for generations before Roxanne Quimby told them they couldn’t. This is a big concession from Elliotsville Plantation Inc., the nonprofit foundation Quimby created to manage the land and the National Park idea. Quimby still sits on its board, but Lucas, one of those twins born in the cabin, moved back to Maine a year and a half ago from Seattle, where he was a fishing guide, to take over as president. (His twin sister, Hannah Quimby, runs the charitable Quimby Family Foundation.) As for Roxanne Quimby, she’s stepped back into the shadows and, through Lucas, declined to be interviewed for this story. 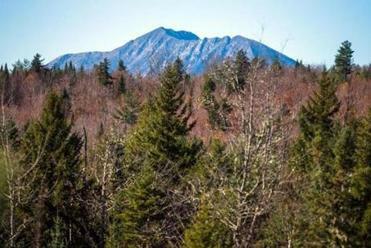 The family’s new offering is a political bargain: We will give you land to use as you have long used it and call it a national recreation area if you will support us using the other plot to create Katahdin Woods and Waters National Park. So the question of the moment is: Is this an offer where everyone wins? Or a big lie, a smoke screen that will allow the federal government to take control of the region and destroy a way of life? 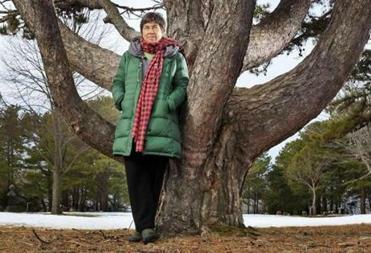 Roxanne Quimby (Shown in 2011) has stepped out of the spotlight and put her son in charge of her plan to create a new National Park in Maine. ROXANNE QUIMBY, 63, ended up in Maine in the mid-1970s by way of art school in California. As St. Clair tells the story, after the Transamerica tower turned San Francisco into a “real city,” Quimby and her then-boyfriend joined the back-to-the-land movement and bought 20 acres near Dover-Foxcroft. In Maine, about a decade later, Quimby met a reclusive beekeeper named Burt Shavitz, and together they turned beeswax into a boutique soap business. In 1991, Quimby created the recipe for Burt’s Bees lip balm (that’s Shavitz’s face on the packaging) and sales exploded — she soon relocated her corporate headquarters to North Carolina, a move that has never sat well with her critics. By 2007, Quimby had sold the company to Clorox for nearly a billion dollars. Her personal fortune is said to be in the neighborhood of $350 million, making her the third wealthiest person in Maine after L.L. Bean chairman Leon Gorman and author Stephen King. Even before she cashed out, Quimby had been using her money to buy up land, staggeringly large swaths of land, often from struggling lumber companies. The 100,000-plus acres she now owns puts her at number 88 on The Land Report’s annual list of the nation’s largest landowners. From the earliest days of her land grab, Quimby has had her eye on creating a National Park. To outsiders, this sounds benevolent, but many of the people who actually live up here don’t see it that way. Because with a National Park comes the federal government, and with the feds can come things like stringent environmental regulations that critics fear would cripple any industrial activity near a National Park. Some believe even the specter of a park has kept business away. There are also many who claim the proposed “small” National Park — just 75,000 acres, against a median of 317,000 — is simply a front for her real dream: a 3.2 million-acre park once proposed by a group called RESTORE that would be larger than Yosemite and Yellowstone combined. The Quimby camp has consistently denied it has such secret plans. If Quimby started her quest with an unpopular idea, the way she went about selling it was even more so. There is a long tradition in northern Maine of privately owned land remaining open to traditional uses, but Quimby closed her land to hunters and to the snowmobilers who had long relied on it for north-south access. When she evicted people from camps that had been built on land temporarily leased from timber companies and burned several of those camps down to reclaim the wilderness, she created a PR nightmare. After years of battles, the entire project went silent around 2012. 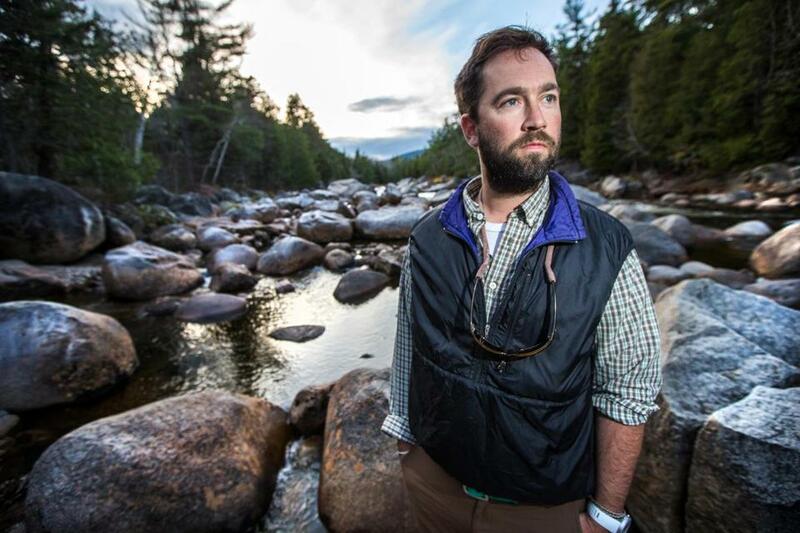 By design, Quimby stepped out of the public eye and the project got handed over to a guy who shoots his dinner and, after graduating high school, hiked the entire 2,180-mile Appalachian Trail alone. A guy who represents, for many, everything that Roxanne Quimby is not. A guy who just happens to be her son. I told you it was complicated. So let’s do something simple, something St. Clair is banking on: When they reopened the land that would be the National Park, it included a new 18-mile loop road, a very rough draft of what people might see if they came to visit. So let’s go take a look at it, shall we, and assess its National Park-ness. Critics have problems with the logic that Quimby’s land would be worthy of a National Park simply because it provides kodak moments of Mount Katahdin. LUCAS ST. CLAIR is driving me across a narrow bridge over the East Branch of the Penobscot to get to the loop road in the proposed park. By this point, we’ve been together for three days. It was only supposed to be one, but the area had been fogged in and the loop road depends on views. The entire park depends on views. So I end up camping on his property with my wife and two kids, and we are folded into St. Clair’s own family vacation. He has a 2-year-old daughter named Ella, and his wife, Yemaya, a journalist and outdoor writer — she and St. Clair co-wrote the AMC Guide to Winter Hiking & Camping — is pregnant with their second child. They have come up from their Portland home to get a look at the loop road, along with one of St. Clair’s childhood buddies and his family. While we wait, the kids play, St. Clair takes me for a boat ride on the East Branch, where we spot a bald eagle, he sneaks off to shoot grouse, and we all go canoeing on Shin Pond. When the weather finally breaks on the third morning, we all pile into a van and head off. Finally driving the loop road, we pass through a canopy of trees, each one seemingly more ablaze in color than the last. And then more trees. Then more trees. It’s just trees. There, I said it. Yes, there are pristine lakes and rivers tucked here and there, but there’s no showy centerpiece, which is one of the big knocks on the park idea. There’s no Grand Canyon, no geysers, no scenic coast like you’d find at Acadia National Park (which, incidentally, is the only National Park in the Northeast out of 59 such parks). As far as land goes, it is no more or no less beautiful than the millions of acres of forest around it. And here’s the crazy thing: I don’t think that means it shouldn’t be a National Park. At least not on those grounds. Because what it represents is a perfectly preserved specimen of all that is great about the north woods — untouched wilderness, clear streams, wildlife galore, and grand views of Katahdin. As we bounce along the dirt road — they like to say it’s not yet “Prius-ready” — we pass a grouse and St. Clair wonders aloud if he might be able to take it out with a rock. Later, we turn up a path to an overlook on a hillside that had been carved by one of the road builders, a man who had a hunch that if he just plowed his way up there, he’d find something special. He did, and this is where Lucas takes people he’s trying to sell on the idea. Environmentalists. Politicians. Friends. Enemies. Journalists. Everyone is getting the tour; St. Clair’s best political weapon is this overlook. When we get out of the van, Mount Katahdin looms before us, slowly coming out of the fog as if on cue. To the left, Millinocket Lake shimmers. The park would preserve what Lucas calls the “view shed” of Katahdin, the endless forest you would see if you looked east from its peak. And in that moment, the reason why the park has to be this plot of land makes more sense. A QUESTION that is often asked is: Why does this land need to be a National Park? Why not donate it to the state, which would have less restrictive rules? Or why not just preserve it privately, as the Colorado-based media mogul John Malone pledged to do when he bought nearly a million acres of Maine woodland in 2011? “I intend to continue the forestry operations consistent with prior practices,” Malone said at the time. The answer from St. Clair and his mother before him has always been that they want the brand equity of the National Parks. The designation is its own draw, marking “the greenest spots on the map,” as St. Clair says. And National Parks, their argument goes, bring tourism and employment that would reinvent a region crippled by the loss of jobs in the forest products industry. In his press materials, St. Clair cites studies showing that other regions that have a National Park and national recreation area of a similar size, located a similar distance from a major airport, lead to personal income and job creation that exceed national averages. Those studies have been endlessly dissected by opponents, who argue that the stated goal of siphoning off 250,000 of the nearly 2.5 million people who visit Acadia each year is a farce. Even nearby Baxter State Park, which has been around for generations and has more signature attractions, draws fewer than 100,000 visitors a year. But let’s just say, for the sake of argument, that despite the mud season and the black fly season and the too-cold-to-breathe season, the land belongs alongside America’s great places and deserves to be a National Park. What’s so bad about that? Well, opponents say, everything. Environmentalists, politicians, friends, enemies, journalists, everyone is getting the tour from St. Clair. St. Clair believes the offering of the national recreation area removed most of those clubs, but overcoming a deep-seated hatred of the federal government has been trickier. Never mind that his PR pros have been willing to point out that residents here rely heavily on federal assistance and that the park would offer jobs that could get them off the government’s dime. 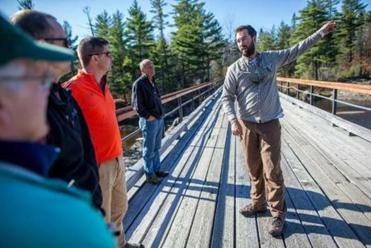 Opponents counter that the jobs would be low-paying and seasonal, and the park would cripple any chance of the forest products industry reinventing itself. He’s in it for the long haul and, as my wife pointed out to me, there’s something to be said for the fact that he’s essentially working to give away his own inheritance. But St. Clair says the park is his inheritance, and he concedes that his fight may go on until his own children inherit it from him. Quimby’s original goal was to donate her land in 2016, the 100th birthday of the National Park Service, but that no longer seems likely. When the tour is over and it is time to leave, Ella, the possible future heir, is asleep in the back of the van while her mother lounges on the grass outside. My wife and I pack up our camp and take one last look at the East Branch. I go to say goodbye to St. Clair, but he is nowhere to be found. With his family occupied and the reporter finally off his tail, he has sneaked off with his shotgun to look for that grouse. Billy Baker is a reporter for the Globe. E-mail him at billybaker@globe.comand follow him on Twitter @billy_baker.